I am so glad I read this. Like, Jane Lynch, I grew up wanting idolizing folks like Carol Burnett, (who wrote the introduction) and hoped that someday I’d be an actress. Unlike her, I didn’t have the talent, or drive, or happy accidents it took to get there. 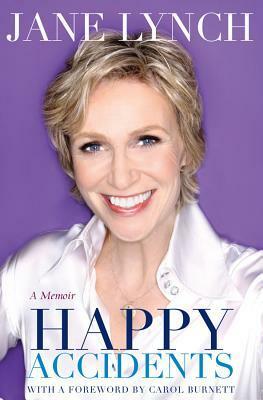 I do, however, have this book, along with all seasons of The Carol Burnett Show, and a growing collection of Glee tunes. My favorite movies these days feature Ms Lynch; her appearance in Talladega Nights made the movie for me. (Granny L:aw. We need more of that). Now that I’ve read her memoir, I’m glad to know she’s a terrific, real, happy person. No, it isn’t “great literature.” So what? It’s well-written, funny, heart-felt, and teaches a few small lessons. And it was just what I needed. And that was a happy accident.